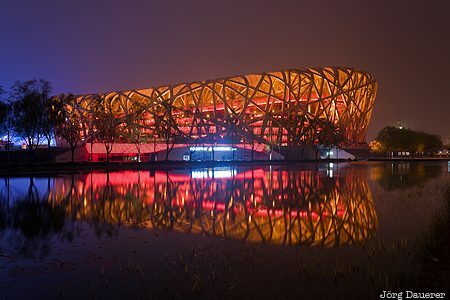 The flood-lit Beijing National Stadium (also known as Bird's Nest) at the Olympic Green where the 2008 Summer Olympics took place and its reflexions at the blue hour after sunset. The Olympic Green is in the Chaoyang District of Beijing, the capital of China. This photo was taken in the evening of a cloudy day in April of 2015. This photo was taken with a digital camera.